Man: I think it’s October but I can’t be sure. We all walk it. At times, we might think we know where it’s headed but we would be lying to ourselves if we said we knew that with utter certainty. The fact is that the world outside your window is constantly changing and one day, it may not even be there. It is the manner in which you handle that fact that defines a significant part of who you are. You could not bother with any of it seeing as how it is all essentially meaningless anyway. On the other hand, you could see the time before you as precious and infuse it with everything you have in order to create your own meaning in this great, big world. There is no right or wrong way to do it but your shot is now and you’re walking down that road whether you want to or not. 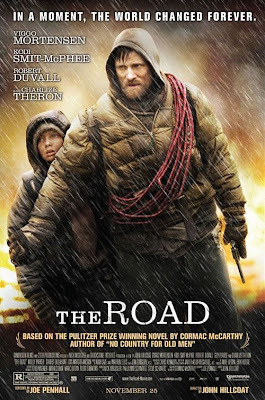 Do yourself a favour though and see John Hillcoat’s post-apocalyptic reflection on the human spirit, THE ROAD, while you’re out there. Just as it is in the Pulitzer-prize winning novel by Cormac McCarthy that the film is based upon, there is no confirmation as to what halted life as we knew it. It could have been a nuclear disaster or a solar explosion but how it happened hardly matters. What does matter is what is done after it happens. Viggo Mortensen and Charlize Theron are a seemingly happy couple before and tragically divided after. All he can see is how fortunate they are for having survived and how they must persevere given this particular fortune. All she can see is how everything worth living for before is now gone. Caught between them is the young boy (fresh face, Kodi Smit-McPhee) that was conceived before and born after the world ended. There isn’t much plot to speak of, just a journey to find hope in the form of food or comfort or warmth and security. Luckily, Mortensen leads with a strong command and a determined sense of purpose that both impresses and inspires a similar determination in the viewer. The road for the movie itself was a lengthy one. THE ROAD was due to be released last fall but the studio felt that the marketplace was crowded and that the film could benefit from a stronger post-production period. I can’t say how the film stood up a year ago but it certainly stands up straight and tall now. Cinematographer, Javier Aguirresarobe (VICKY CRISTINA BARCELONA, NEW MOON) paints bleakness with so many shades of gray that the absence of colour becomes a colour all unto itself. Of course the canvas he has to fill is inspired by an incredibly detailed and realistic production design. This is a world covered in ash and littered with abandoned vehicles and discarded belongings. Barren trees crash to the ground without warning and empty basements might be filled with much sought after canned food or people simply wasting away and waiting to be eaten by other people. It isn’t an easy world but it is still the only one they’ve got. You know what they say, right? It isn’t at all about the destination. As Mortensen and Smit-McPhee make their way south, they teeter back and forth between belief and defeat. They don’t know what’s waiting for them; they just know they have to keep heading there. Just like the road underneath your own feet, THE ROAD is not an easy experience. It is however one of unconventional beauty that is rich with meaning and that leads to a place of deeper understanding. You just have to walk it.